This natural deodorant uses shea butter, essential oils, and bentonite clay to keep you fresh all day. Whether you're getting ready for your work day, just hit the gym, or both (go, you! ), chances are your underarms are about to get splashed with a little something for, uh, freshness. 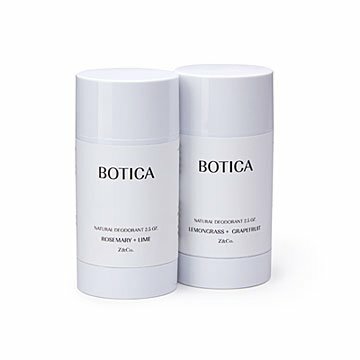 Keep that sweat-prone area smelling nice, no sketchy chemicals required, with this natural deodorant. Made from good stuff like essential oils, shea butter, and bentonite clay by Zee Thomas , the stick does the trick without clogging pores. It's also free of parabens, phthalates, and aluminum, so you can feel good about making it part of your daily hygiene routine. (A few members of our team already have.) Made in Galveston, Texas. When Zee Thomas moved to Galveston, Texas, her husband was a full-time student and she was a new mom. As she started exploring the island, she discovered that it’s a thriving tourist town, filled with gift shops and boutiques. It inspired her to create a candle line to sell locally, then she realized she could expand it to include wellness products that had the same natural, handmade touch. Zee’s business started taking off, but she was faced with an unexpected challenge: a hurricane, which destroyed her home and studio. The same week, though, she learned a new baby was on the way. Now that the business has recovered (and her kids are old enough to help out) it’s a family-run operation. Even their dog, Maggie, hangs out at the studio to remind them when it’s time to take a ball-throwing break. Charlie, their cat, provides moral support. Deodorants are made while listening to Stevie Nicks which makes them 100% more awesome and effective. I have the lemongrass grapefruit scent which is bright with citrus, with an earthy undertone. The deodorant feels smooth and applies easily. As someone who is highly sensitive to most deodorants I have purchased at the grocery store, I was looking for something that would sooth and protect my sensitive skin, while also keep this working mama smelling fresh and clean all day long. I work up a sweat during my daily workouts and have found that this product prevents odor even after a 5 mile run in the humid, South Texas Heat!